Ursula Kroeber Le Guin (October 21, 1929 — January 22, 2018) was an American author of novels, children’s books, and short stories, mainly in the genres of fantasy and science fiction. She has also written poetry and essays. First published in the 1960s, her work often depicted futuristic or imaginary alternative worlds in politics, natural environment, gender, religion, sexuality and ethnography. She influenced such Booker Prize winners and other writers as Salman Rushdie and David Mitchell – and notable futurism and fantasy writers including Neil Gaiman and Iain Banks. She has won the Hugo Award, Nebula Award, Locus Award, and World Fantasy Award, each more than once. 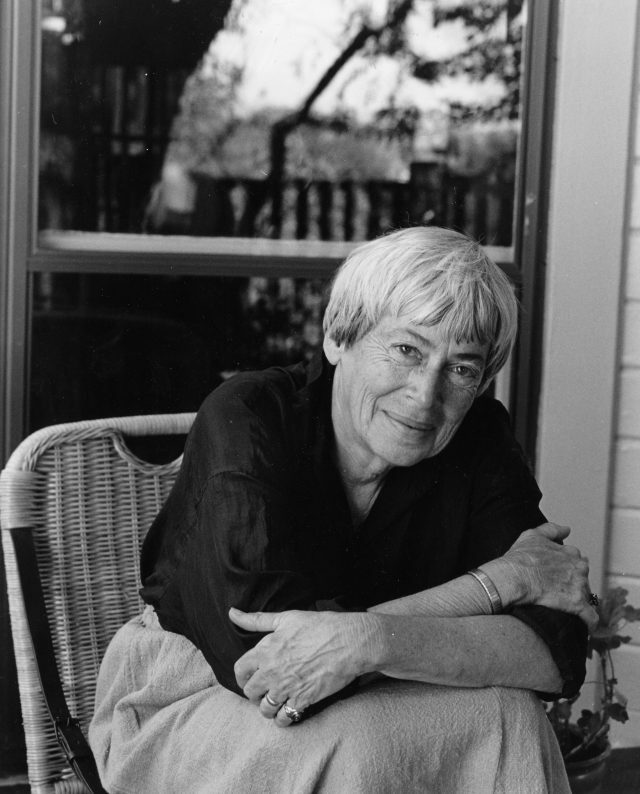 Le Guin has won dozens of annual “year’s best” literary awards. For novels alone she has won five Locus, four Nebula, two Hugo, and one World Fantasy Award. (The Dispossessed won the Locus, Nebula, and Hugo.) She has also won those four awards in short fiction categories, although she turned down a Nebula award for her novelette “The Diary of the Rose” in protest at the Science Fiction Writers of America’s treatment of Stanislaw Lem. Her nineteen Locus Awards, voted by magazine subscribers, are more than any other writer has received. Her third Earthsea novel, The Farthest Shore won the 1973 National Book Award for Young People’s Literature and she has been a finalist for ten Mythopoeic Awards, nine in Fantasy and one for Scholarship. Unlocking the Air and Other Stories was one of three finalists for the 1997 Pulitzer Prize for Fiction. Recognizing her stature in the speculative fiction genre, Le Guin was the Professional Guest of Honor at the 1975 World Science Fiction Convention in Melbourne, Australia. That year she was also named the sixth Gandalf Award Grand Master of fantasy. The Science Fiction Research Association (SFRA) gave her its Pilgrim Award in 1989 for her “lifetime contributions to SF and fantasy scholarship.” At the 1995 World Fantasy Convention she won the World Fantasy Award for Life Achievement, a judged recognition of outstanding service to the fantasy field. The Science Fiction and Fantasy Hall of Fame inducted her in 2001, its sixth class of two deceased and two living writers. The Science Fiction and Fantasy Writers of America made her its 20th Grand Master in 2003. In 2014, Le Guin was awarded the Medal for Distinguished Contribution to American Letters by the National Book Foundation, a lifetime achievement award. Her acceptance speech, which criticized Amazon as a “profiteer,” and praised her fellow authors of fantasy and science fiction, was widely considered the highlight of the ceremony. Ursula K. Le Guin reads from "The Wizard of Earthsea"